We buy the cheddar style & mozzerella style shreds on a regular basis. (and recently found pepper-jack style shreds) They are all wonderful! The “cheddar-like” shreds taste a bit like smoked cheddar, but still yummy. The product melts & stretches. These “cheeses” are dairy, lactose and casein free… gluten and soy free… cholesterol free! They are a God-send for my daughter that has dairy, whey, casein, soy, peanut & kidney bean allergies!!! Thanks for sharing your food find! 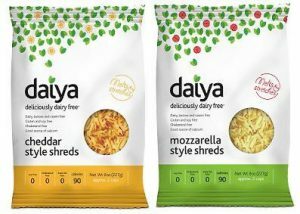 We love Daiya products, too!